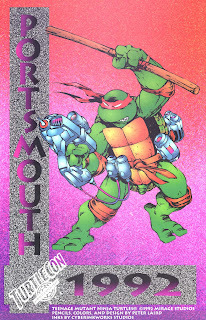 Back in 1992 we held the Portsmouth, NH "TurtleCon", the only "official" TMNT convention to date. Held at the Portsmouth, NH Sheraton, it was a lot of fun. This is something I put together as a free handout at the show. It's one of my early Photoshop experiments (I think I was probably using Photoshop 2.5 back then!). I don't know exactly what the heck that gun Don is wielding does, but it sure looks cool. 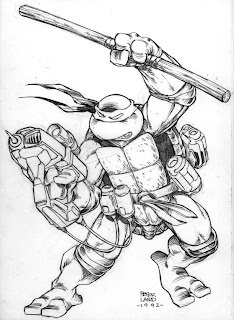 Before doing the color work in Photoshop, I "cyberinked" the pencil drawing of Donatello. Has there been any interest in putting together any more TurtleCons? How many people attended the convention back then? I remember trying one way back in 1996, and I couldn't get used to the smallness of the tablet, and how large the drawing showed on screen..if that makes sense.. I'd love any video or pictures of TurtleCon. very little information is ever known about it..
-->> ..i recall T-con '92. I was in a hospital when i read about it, and it was like a pipedream. Was terrible sad i never got to go. I went to one of the unofficial ones. Never would have thought i'd ever get to go to something like that. Another official one would be insane. TMNT25 celebrations & cons may be the closest i'll get this year !! god i hope you make it to the West coast , Pete. -->> what is ' Cyberink works studios ' ?? i mean i know it is in regards to the cyber inking process.. but - - ?? If that was inked on the PC, and not drawn by hand, how was it done? No way anyone has that steady a hand with a mouse, and drawing tablets back then hardly worked that well, at least for me :)...."
i mean i know it is in regards to the cyber inking process.. but - - ??" Dragon Turtle- I asked about putting together another convention centered on the turtles at a few boards and basically got laughed off the topic.